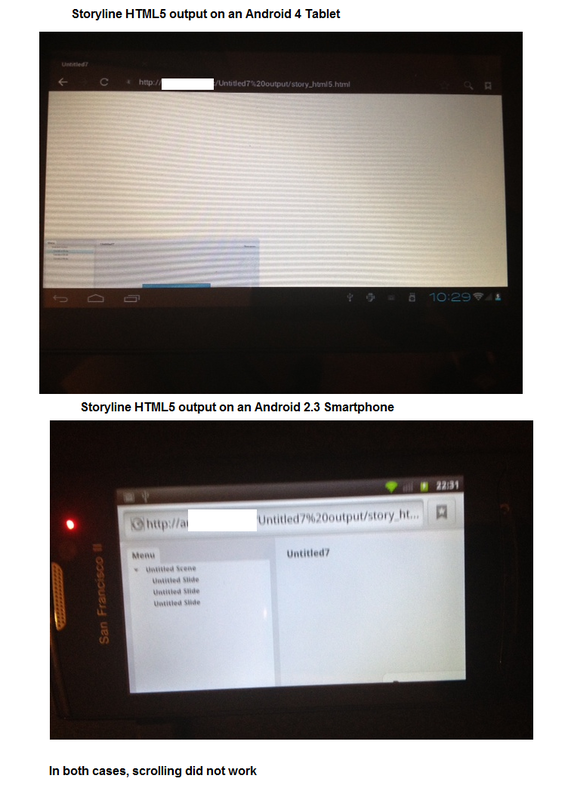 I tried to run Storyline content as HTML5 on an Android phone, it actually worked! See attached screen. Obviously, the playerbar controls are way too small for that screen size, but all the triggers, audio, animation, etc. behaved just like on an iPad. It would be nice to have a template/playerbar set with larger, 'floating' buttons, like the movie player controls on an iPhone. Hey, congrats. Didn't work when I tried it. Any chance of sharing your .story project? What did you see on your screen when attempting to load a storyline output? I've been surprised at how well UI / slide interactions including drag and drop type activities have worked on my iPhone and android devices from SL publish. Safari iOS is pretty bad about audio and video files, that's disappointing but not HTML5 or Articulate's fault -- the new norm with HTML5 stuff is going to be that struggle to bend stuff to work across platforms consistently. I love HTML5 for documents and see lots of promise for applications. Geolocation, local storage, and web workers are the bomb. I think it falls short in the consistency department and for mediated interactions and presentations, something is missing from the experience. I'm completely spoiled by smooth functioning Flash based outputs and desktop production tools. Are you sure it's actually playing the HTML5 output? If you're on an Android device, then you should have Flash. If your device has Flash & you are opening the "story.html" file, it will automatically default to the Flash version of the course. The one thing you want to be careful of when checking the HTML5 output as an option on the publishing screen is knowing what devices your potential audience might be running. Although HTML5 is a nice feature, it has quite a few limitations depending on the browser the learner is using. I personally have turned HTML5 off when publishing as I have learners that might be coming from all types of browsers and I don't want them to have a poor experience just because of their browser issues. I'd rather they not be able to play it at all. So it does work, it just doesn't display the content central to the screen. I need to fool around with it more, but I also had trouble getting the content central enough on my screen to make it useable. (Android phone). What about publishing to a more phone friendly size? What about publishing to a more phone friendly size? I tried that - didn't work, same issue - still not central and scrolling doesn't work. I tried that - didn't work for me also, same issue I am facing. Please feel free to submit cases so we can learn more about the issues you're experiencing. Thanks! Please use this code as a workaround in your story.html devices. Its tested across Android devices. This code will also work across tablets. IOS devices wont be affected as they use the ios file to launch. I am trying to get some StoryLine content to work on a Motorola Razor phone. Can you tell me where the code in the previous post is inserted? Thanks for posting this info, Dean! I think it will solve my problem. We had some issues testing a mock-up project with interactive (drag & dropper triggers). The content works fine on iPads (html5 and mobile App). On an Android device (Samsung Galaxy Tab) running Jelly Bean the content displays but the drag and drop does not work. Same issue on an Android phone. Any clues? Our customer has a BYOD policy so supporting all platforms is super important. I am currently running into a host of issues related to courses being run within SumTotal's Mobile App (for iPad, iPhone, and Samsung Galaxy Tab). To begin with, my formatting seems off. In every case, the course is not filling the screen, instead staying to the left with a large white area to the right. Check my story size settings, and they are set to Scale to Fit (if size is larger or smaller). My player browser settings are set to "resize browser to fill screen" and "scale player to fill browser window" . I am outputting to HTML5, but not selecting Articulate Mobile Player option (have tried it both ways though). In addition, I have a video in the course that doesn't play. Not sure if the issue is story side or server side. I have taken a step back and decided to create course for iPad/iPhone only, so we are willing to dismiss the Samsung issues at this time. However, we will eventually need a solution that is broader reaching. This is a new issue. My first 4 test courses worked fine until about 2 or 3 weeks ago, when they started getting "wonky" (technical term). Course content was NOT changed in the LMS during that timeframe, making the issues seem completely random. Does anyone have any experience with SumTotal's Maestro LMS and the SumTotal Mobile App? Can some one tell me where I will place the code if I use story_html5.html and do not use html file? Have you found a solution for android yet? We are currently testing our storyline work on Samsung Galaxy Tab 2 and found that most things work well when opening HTML 5 docs using Dolphin Browser. Scrolling, drag-and-drop, hover etc. all work. Only things we are unable to get working is the links to url's and video playback. Does anyone have any advice on how we could perhaps get that working on Android? 980x658 is the storyline project size? Hi Vanitha and welcome to Heroes! You may want to try and connect directly with Dean, as I'm not certain who is still subscribed to this thread, and that post was some time ago. Currently Articulate does not officially support Android devices or browsers. Click here to review the system requirements for authoring and viewing Storyline content. If you'd like to see official support for a particular mobile device, we welcome your feature requests. What we'd like to see is a published commitment from Articulate to provide support for Android, as it's the official "other" OS with regard to iOS. We keep submitting feature requests and hearing nothing back, or even any calls for feedback, or surveys to indicate that Articulate is even treating their feature requests seriously. I've submitted many of them, some simple (bring back this button you took away), some as complicated as "Android support"
Has anyone ever considered how amusing it is that Articulate's software only works on Windows, but their mobile output only works on iOS? FYI, Storyline 2 now supports Android. Yes, Android support was included in Storyline 2 and you can view the whole system requirements and viewing requirements where that is mentioned here. Publish to LMS with flash option, but don't check "Use Articulate Mobile Player for iOS and Android"?